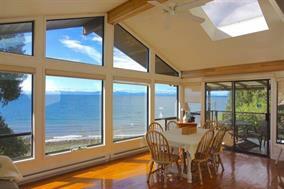 Waterfront home with best beaches, water access, southwestern views and sunsets! This is truly a home that provides summer memories on the beach and year round. 1980 Ocean Beach Esplanade has just received many tasteful updates and renovations to the kitchen, bathroom, floors, entry, paint and much more! The upstairs of the home consists of large, open spaces, vaulted living room with cozy wood stove, and equally large dining room with lots of windows to watch the sun set year round. There are two bedrooms and another nook area perfect for day bed or office. Downstairs is a self-contained in-law suite and lots of storage. The .88 acre lot provides privacy, garden paths to a gazebo and a detached carport. Great opportunity!